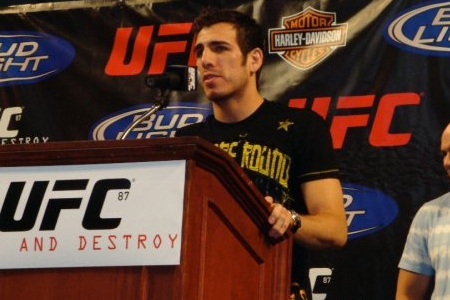 According to MMAJunkie, UFC star Kenny Florian (Pictured) will serve as the color commentator on the UFC’s second broadcast team. Florian will rock the mic alongside newly-signed play-by-play announcer Jon Anik. Anik and Florian will call this Friday’s “UFC on FX: Guillard vs. Miller” event inside Bridgestone Arena in Nashville, Tennessee. The tandem will compliment longtime Octagon commentators Mike Goldberg and Joe Rogan in the company’s smaller shows on FUEL TV and FX. Goldie and Rogan will still provide analysis for the UFC’s pay-per-view broadcasts. Frank Mir and Stephan Bonnar were also under heavy consideration to land the gig. Florian is currently on the mend from a serious November back injury that has the 35-year-old contemplating retirement. The former ESPN2 “MMA Live” co-host is also a member of FUEL TV’s weekly “UFC Tonight” show.